Happy Wednesday, friends! Can you believe that we're almost halfway through October? While we’re pretty zoned in on our little living room renovation right now, we’re still in love with fall style and will use just about any excuse to break out our favorite chilly weather wardrobe items, including a date night on a day when the temps decided to dip ever so slightly here in Phoenix! We recently took advantage of some nice weather and Chris having a rare night off and ventured out on a proper date night that included a little neighborhood walk, dinner at a yummy new restaurant in town and a movie. Our jam-packed, slightly opposite schedules have left us craving a date night of as of late, so it was pretty awesome to get a night all to ourselves to try some great new food at Hearth ’61 at Mountain Shadows and take in a flick together. I’ll use any excuse to talk at length about fall, so what are your favorite style staples of fall? Are you more addicted to flannel than Jordan Catalano and Angela Chase (side note: please tell me you loved My So Called Life as much as I did)? Can't stop collecting coats despite the fact that it never goes below 75 in the winter in your neck of the woods? Boots have you busting out the fall duds way earlier than necessary every year? Or do you just crave that rich fall color palette every time you see a leaf hit the ground? Drop us a comment in the comments section down below so we can all trade stories about our ridiculously played out love for fall and all the style goodness that comes with it! So what are my fall style staples? The first is tights. That’s right I said it… it’s tights! It may seem like a strange style obsession, but every single year when the weather cools down I look forward to wearing tights with skirts and dresses. There’s just something so decidedly girly and polished about sporting a pair of pretty opaque tights under a fall-ready mini like the Jack by BB Dakota faux suede number I’m wearing in today’s pics, and while I’m all about being a rebel on the style front and trading pretty and polished for something unexpected, I just love me some tights. Plus, they're just plain practical. They keep my legs warm, are super comfortable if you score the right kind (love these tights from Banana and DKNY tights are another super soft favorite) and let me wear fun little skirts without having to blind unsuspecting passersby with my reflectively pasty pale gams. Another favorite? This beautiful burgundy hue that seems to be everywhere when fall hits. Or is it oxblood? Maroon? Wine? Bordeaux? Whatever it's called, I'm (obviously) in love, hence the skirt/tights/shoe combo, all in some version of that wonderful color. I've been coveting these perfect Frye Erica Oxfords in Bordeaux since I came across them toward the end of summer, and when I found them on serious sale on Amazon and scooped them up, I decided I'd never take them off. The leather is absolutely gorgeous and a perfectly pointy oxford in fall's favorite color is what fall shoe dreams are made of. I typically wear a 7.5, but went up to an 8 in these due to the narrow toe box. I also pair them them with ankle jeans and pants and have gotten so many compliments! 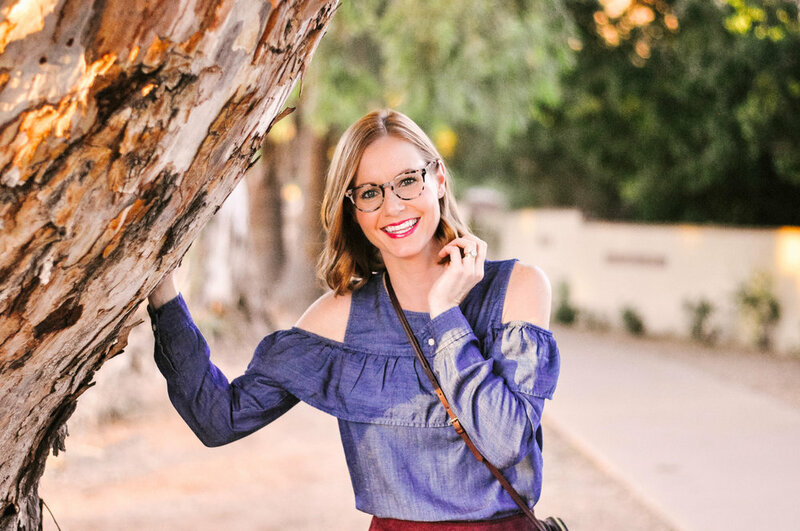 As I mentioned in this post not long ago, fall always makes us both feel like switching it up on the specs front, too so a fresh pair of fun, fall-ready glasses has become another seasonal staple for us. Both pairs of specs we're wearing here are under $70 and we've both said that these are our favorite pairs of glasses to date! They're both from EyeBuyDirect and I'm wearing the "Notting Hill" in Ivory Tortoise and Chris is wearing the "Exposure" in Macchiato Tortoise. They're both extremely comfortable to wear, they're the perfect color combos for fall and they both have great shape. Win! For Chris, the opportunity to start breaking out his favorite lightweight flannels in the fall is something he (secretly) treasures. Every time the temps dip here in Phoenix or we get the chance to head to a cooler climate in the fall, I see Chris pull out one of his beloved flannels like the one he has on here, and I couldn't be more on board. They're super soft - who wouldn't want to wear that all day? 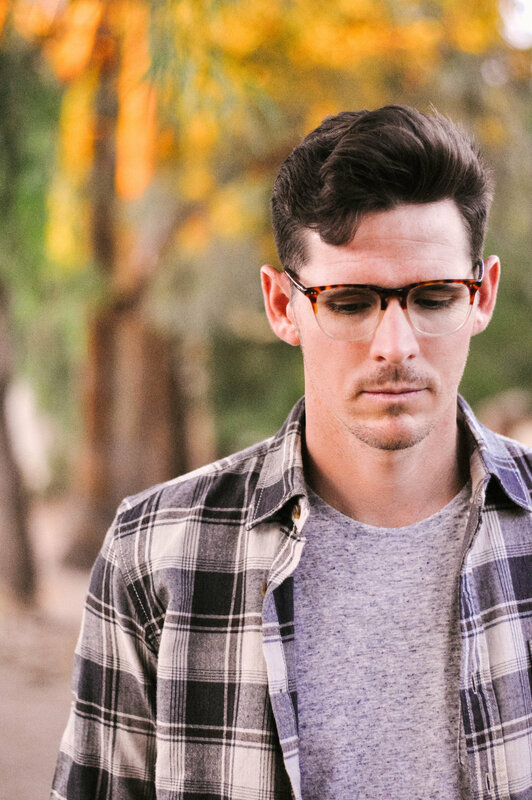 And dudes, if you're not sure about sure about this fall/winter style staple, just remember that flannel doesn't have to wreak of 90s grunge or lumberjacks... a lightweight flannel in a pleasing color palette is always a good idea, like this one and this one! Not only did we get to sneak in this extra special date night, but we also just got back from a few days traveling from Tucson to California for a beautiful fall wedding celebrating two lovebirds and a little Carter family time for Chris' dad's big 70th! We're totally not ready to be back to work and to our regular ships-passing-in-the-night schedules, but we'll be savoring our few uninterrupted days together to get us through the rest of the week. Here's hoping you're all indulging in a little fall fun with your family and friends!